Warning: these cookies are dangerously good & may cause you to eat multiple amounts at once. So I was very happy to find a recipe with ingredients I already had at home! I had no idea what angeletti was but I had the ingredients, I didn’t need a mixer and it was a simple recipe. This is a really easy and quick recipe if you ever need to whip up some dessert. 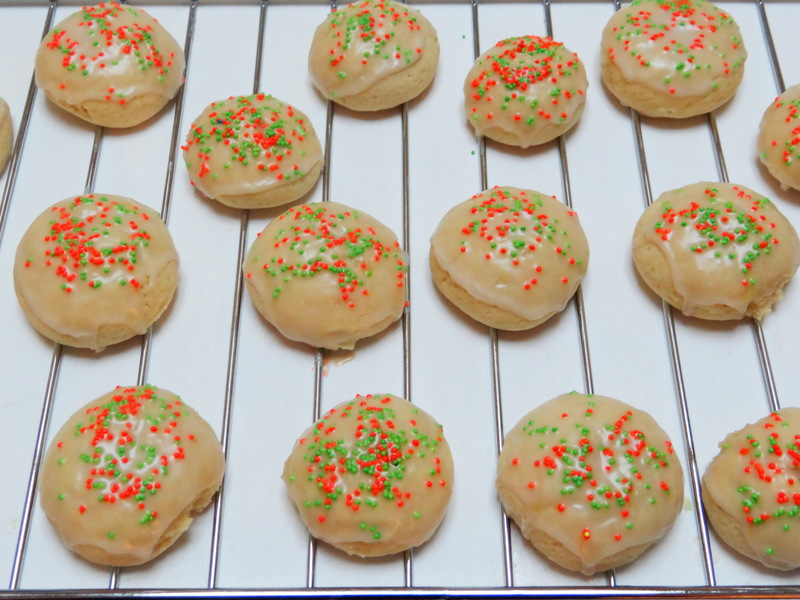 Angeletti is an Italian cookie and it’s a mix between a shortbread and sugar cookie. You mix butter, vanilla extract, egg & sugar and then add in flour, baking powder & salt. Roll them into little balls– they puff up big in the oven so I rolled them into the size of cherry tomatoes. While they’re in the oven, you make the glaze which just consists of confectioners sugar, vanilla extract & water. When the cookies are done, dip the top portion into glaze and then top with sprinkles. Make sure you add sprinkles right away since the glaze hardens quickly. This is a guaranteed crowd pleaser so next time you need to take dessert anywhere, I recommend making angeletti! 2. In a medium bowl, whisk together the butter, granulated sugar, vanilla, and eggs until blended. Add the flour, baking powder, and salt and mix until just combined (do not overmix). 3. With floured hands, roll level tablespoonfuls of the dough into balls and place on parchment-lined baking sheets, spacing them 2 inches apart. Bake until puffed and the bottoms are pale golden, 7 to 8 minutes. Transfer to a rack to cool completely. 4. Make the glaze: In a small bowl, whisk together the confectioners’ sugar, 2 tablespoons water, and the vanilla until the mixture forms a thick but pourable glaze (add more water if necessary). 5. Dip the top of each cookie into the glaze and let set, rounded side up, on a rack set over a piece of parchment paper. Sprinkle with non-pareils, if using. Allow the glaze to set, about 20 minutes. Store the cookies in an airtight container at room temperature for up to 5 days.